Well, Panasonic just announced a brand new addition to the LUMIX G Series of Compact Cameras, the LUMIX DMC-G3, this is the smallest and lightest digital interchangeable lens camera with a viewfinder that they’ve ever made. This new camera offers a much lighter and smaller camera than your more traditional DSLR allowing for much greater portability and more creative control. The G3 also features a new 16.0-megapixel sensor that produces rich, true-to-life, high quality images, plus 1920 x 1080 full-High Definition (HD) video recording capability with stereo sound in AVCHD. The Panasonic LUMIX G3 is the ideal hybrid, offering superb still and video capabilities with many easy-to-use features so users at any level can create professional-quality images. The LUMIX G3 offers photographers the opportunity to express their creativity with cool pre-sets like Creative Control mode, which allows for images to be taken with popular visual effects like Retro, High Key, Sepia and High Dynamic. The conventional film mode has also evolved with a new effect control, Photo Style, which has Standard, Vivid, Natural, Monochrome, Scenery, Portrait settings that allow finer adjustment of contrast, sharpness, saturation and noise reduction. The Panasonic LUMIX DMC-G3 is made of aluminum and will be available in a variety of attractive colors, including black, red, white and brown, starting in June 2011. 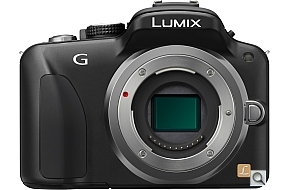 Suggested retail price of the LUMIX G3 WITH the 14-42mm Zoom Lens Kit will be around $699.99. Hi Julie. Where did you get this picture? This is not an image of the G3 that Panasonic released today. The camera actually looks like this: http://imaging-resource.com/PRODS/DMCG3/DMCG3A.HTM. Thanks for the info Harlan, the picture has been updated!